Croydon has a number of different Chinese restaurants that offer a variety of foods from different regions of China. These restaurants are located all around the city and offer different specials and discounts through the week. Along with the great food and specials available, each restaurant offers a unique ambience, that makes it unforgettable. It is important to have a little knowledge of the different restaurants in this area, so you can decide which one is the best option for you. The Xin Chinese Buffet offers you some of the best Chinese foods in Croydon. The Xin Chinese Buffet’s food is prepared by expert chefs from the Far East. This all you can eat buffet ensures that all of the food that you eat is freshly prepared. This is accomplished by constantly cooking new batches of food every hour. The Xin Chinese Buffet offers a number of different wines and drinks from all over the globe. Try one of the great selections of white wines, red wines or Champagnes for a unique Chinese dining experience. Some of these wines come from countries such as: Australia, Spain and France. Xin Chinese Restaurant has lunch specials, dinner specials and even a complete take out menu. The cost of the dinner buffet is £16.50 per person from 5:30pm to 11pm. 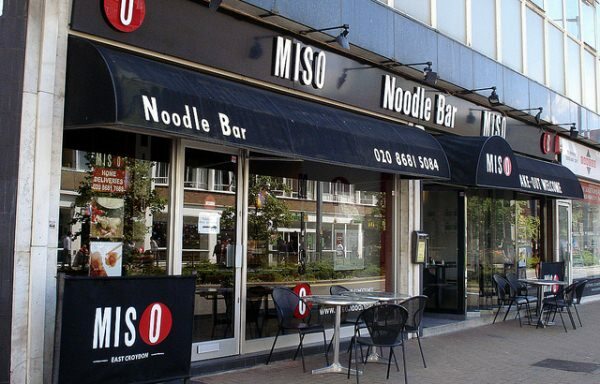 The Miso Noodle Bar is located on the East side of Croydon. This noodle bar is unique as it cooks healthy and tasty chinese food in a casual setting. The Noodle Bar opens up at noon to 11pm daily. The Noodle Bar accepts all forms of payment, including credit cards. The Miso Noodle Bar offers a number of different Bento Boxes, that come complete with clear soup and mixed salad. There are also a number of soups, side dishes, desserts and other Chinese food options available to you. Beijing Cottage East is an awesome option for great Chinese food. This Chinese restaurant is located in the south end of Croydon. This restaurant is well known for Cantonese and Peking dishes. This restaurant serves some of the best seafood and water fowl dishes around. You can taste the finest roasted or Peking Duck in Croydon, served on a bed of scallops. There lunch specials is available Monday through Saturday from 11am to 4pm. This restaurant offers a delivery option with a 10% discount for orders over £10. The Silver Dragon is a family oriented restaurant that provides some of the best Chinese food in Croydon. This restaurant is extremely popular for its affordable prices and quality food. What is best about this restaurant is that you can call ahead and reserve a table or booth. This Chinese restaurant was an incredibly reputable restaurant with enough space for catering large parties. The menu includes: Peking, Chinese, Dim Sum and Cantonese dishes. All of these dishes are prepared fresh daily. This restaurant also offers you a takeout menu that comes with everything. All of these Chinese restaurants offer diners a plethora of great foods and desserts that are top quality. All of these chinese restaurants have top quality chefs that create the tastiest dishes around. These chinese restaurants are all scattered around the Croydon so finding one near you is incredibly easy. Restaurants such as the Silver Dragon, Beijing Cotton East and Xin Chinese Restaurant all offer you take out menus at affordable prices. This means you can enjoy an incredible Chinese meal without having to go over your budget.